What can I use SAS for? I’m flattered. And I hope they found the answer to their question. Though to be honest, I doubt that anything I have previously written addressed the use of SAS in such broad terms. So let me try to rectify that now. Wow, that is a big question! Most SAS users would probably agree that it would be easier to say what you can’t do with SAS than what you can. I know, if you are not a SAS user, then you’re probably thinking that that is an incredibly arrogant statement, but please keep reading and then you can judge for yourself. You probably wouldn’t use SAS to program a robot—unless that robot used a statistical algorithm for it’s guidance. You probably wouldn’t use SAS to write a cookbook—although I have personally used it to write the indexes for all my books. You probably wouldn’t use SAS to design a building—unless you were conducting ergonomic research to improve your design. You get the idea…SAS is a general purpose tool that—with a little imagination—could be applied to almost anything. SAS is a work horse that is used to crunch through gigantic data bases, the kind that the Census Dept. and credit bureaus have. But it’s also nimble enough to be used by students in introductory statistics courses. In short, SAS is a suite of software products for data management, statistical analysis, data visualization and reporting. Another of our more silly data sets concerns minor league baseball teams with names like the Gilroy Garlics and the Sacramento Tomatoes. 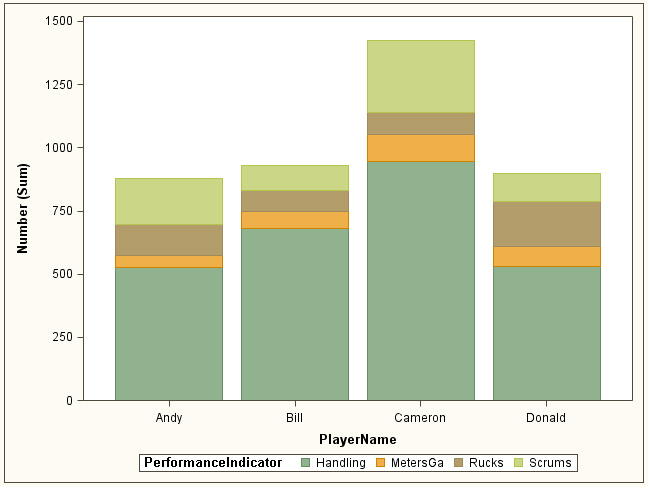 The data didn’t seem terribly believable to me…until we got a question from a reader who was analyzing data for a a very real rugby team. Here is the bar chart to prove it. They say that “Life imitates fiction.” Apparently, it also imitates computer manuals. Long ago someone on SAS-L asked the question “What does SAS do best?” I remember thinking “SAS does everything the best.” By that I do not mean to say that SAS does every single thing better than any other software package. What I mean is that if you want a software package that does everything—or at least as close to everything as is computationally possible—then SAS is the best. Does that mean that SAS is perfect? No. A friend who is a statistician complains to me that SAS is not very good for bootstrapping. And the dot plots that SAS produces bear no resemblance to dot plots in statistics text books that I keep running into. And there is no easy way to get your results from SAS into PowerPoint (although I hear that they working on this last item). Despite these imperfections, if you have a problem that has something to do with data, then SAS can most likely help solve that problem. Probably the biggest problem faced by the sales people at SAS Institute is convincing a skeptical world that SAS does indeed do all that it does.